is a spectacular region of sky just off the left belt star of Orion. Called Alnitak, it's the bright star just above the beautiful Flame Nebula. 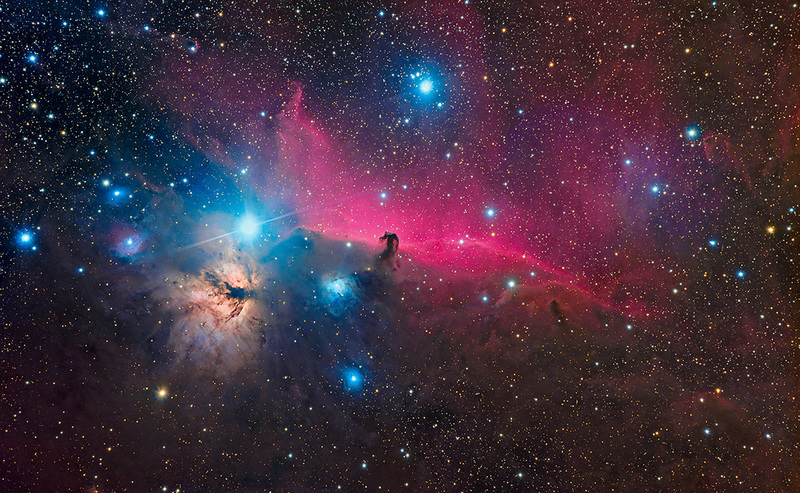 At center is the incredible Horsehead, an absorption nebula designated Barnard 33. The red emission nebula forming the backdrop is IC 434. Despite being a frequently photographed area, it never ceases to impress. Thanks to Cherry Mountain Observatory for this gorgeous data. The photograph was published by Astronomy magazine's online newsletter and served as a cover shot for both Astrophoto Insight magazine and the MWAIC 2009 program. A large format print is featured in the traveling Starstruck: The Fine Art of Astrophotography exhibition.